Nisse miniature painted by myself (and mounted on a penny). I just finished reading Keeping Christmas: Yuletide Traditions in Norway and the New Land by Kathleen Stokker, which is great because it has so much history on the julenisse. My wife is part Danish, so I've become fascinated by these Scandinavian Christmas gnomes. Kids leave treats for them on Christmas Eve, as with Santa in the US. But unlike Santa, these gruff nisser will cause mischief if they feel ignored and they leave no gifts. The tradition of the Danish and Norwegian nisse (known as a tomte in Sweden and a tonttu in Finland) goes back hundreds of years. In pre-Christian Scandinavia it was believed that the spirit of the man who first cleared the land continued to watch over the farm. His descendants left an offering of beer or porridge during the winter holiday. 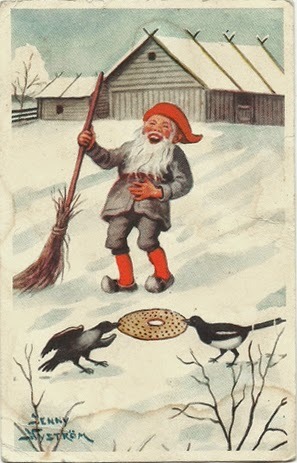 Nisse postcard by Swedish illustrator Jenny Nystrom. Flor apparently believed in the nisser, saying that they took the offerings not because they wanted porridge, but because they wanted to be venerated. By the 18th century the word nisse became more widely used, and illustrations became popular in holiday postcards and in magazines. Besides children, few truly believed in the nisser, but they remained a part of Norwegian Christmas traditions. Today decorative nisser begin to appear in Scandinavian shops as early as November, reminding shoppers that Christmas is coming. We have a friend from Denmark who explained that the nisser appear gradually, building in number as Christmas gets closer. The tradition of leaving porridge for the nisser continues in the Scandinavian countries and areas in the US where many many Scandinavians immigrated (such as Minnesota, Wisconsin, and Iowa). Astrid Lindgren, author of Pippi Longstocking wrote two children's books (with lovely illustrations) about the a nisse on a Swedish farm: The Tomten and The Tomten and the Fox. Christmas at the Tomten's Farm was written and illustrated by Harald Wiberg, the same fellow who illustrated Lindgren's tomten books. The pen and ink art is excellent. Wiberg's book describes traditional rural Swedish Christmas traditions (including old folk superstitions like the tomten). The book is out of print, but you can find used copies on amazon and abebooks.com. At the top of the post I mentioned Keeping Christmas: Yuletide Traditions in Norway and the New Land by Kathleen Stokker. It's a scholar study of Norwegian folk traditions, including maybe ten pages devoted to the nisser. I found the tiny pewter miniature (pictured at the top of this post) on eBay. It was being sold as a fairy garden decoration. I got a bag of 25 of them, but I don't know what company made them. I painted a similar (and slightly larger) nisse a few years ago. You can see that mini here. P.S. 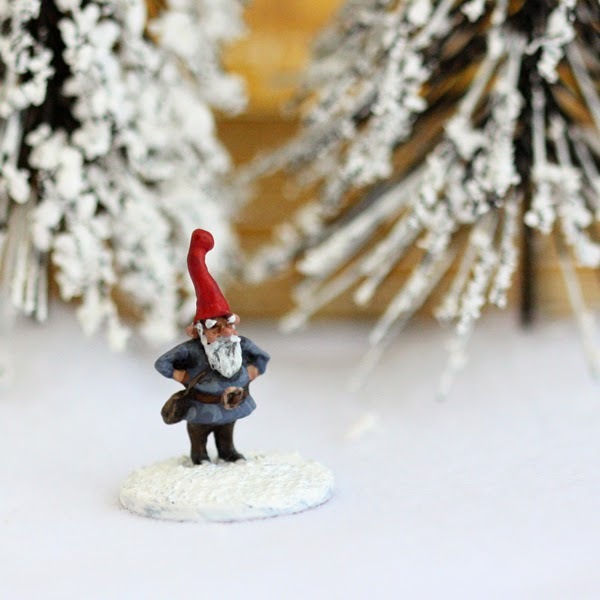 "Julnisser" are the Christmas gnomes, while "Julenissen" is the Norwegian name for Santa Claus.